Public art is everywhere on the Côte d’Azur and France in general, whether it’s a temporary installation for a particular occasion or something permanent, it’s all around. Most towns no matter how big or small take pride in making their public spaces attractive; you can usually find fountains and sculptures alongside well tended flower beds and attractive borders even in the tiniest of villages. There’s even art on the side of the motorways to brighten up your journey! And it’s not all old by any means. New commissions go up regularly, I’m forever spotting something I hadn’t noticed before and then realising that it’s because it’s new and wasn’t there the last time I passed by. 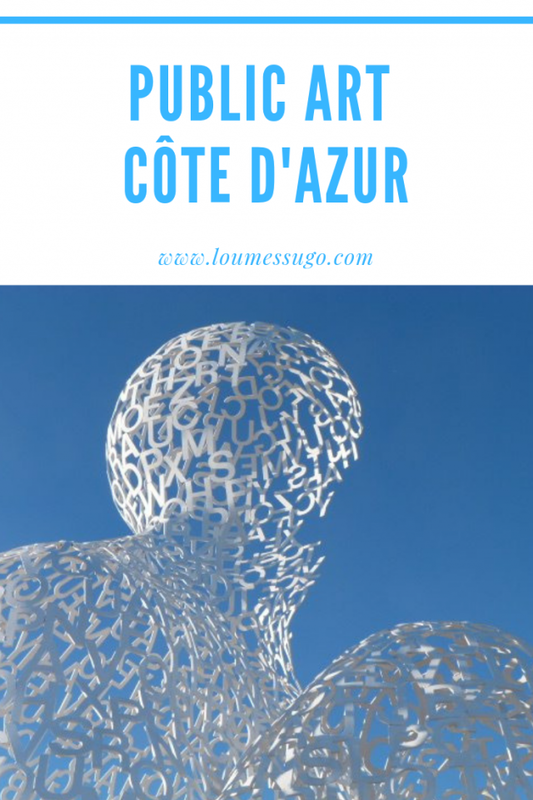 Here are a few of my favourite pieces of public art on the Côte d’Azur. 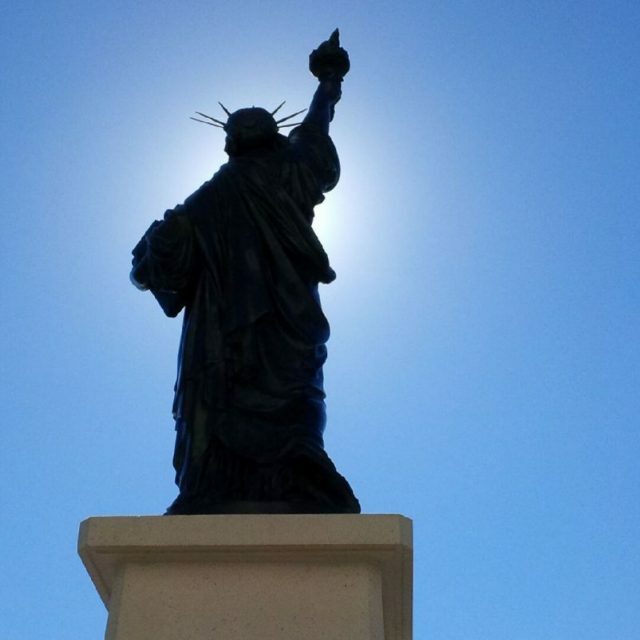 Nomade, by Catalan artist Jaume Plensa, is a monumental sculpture of a squatting man looking out to sea on the ramparts of Antibes. 8 metres high and 5 metres wide, it appears from a distance to be made of lace but as you get closer you realise it is infact created entirely of steel letters painted white. It is open and large enough to walk inside, from where you can contemplate the idea of sculpture made from emptiness and silence. (If there aren’t too many other visitors climbing all around you!) The white letters against the deep blue sky always look dramatic and I love photographing its different angles. 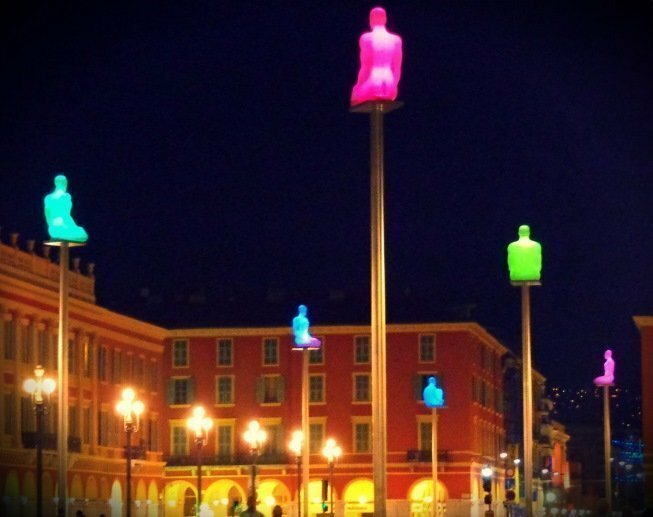 Another monumental installation by Jaume Plensa, Conversations in Nice is made up of 7 crouching men on pillars high above Place Massena, the central square, in Nice. These figures, created out of resin, light up in different colours at night, glowing gently from one tone to another to represent conversations between the 7 continents. I find it very soothing and love watching the colours change. During the day the crouching men keep watch over the busy central square that divides the old town from the new. 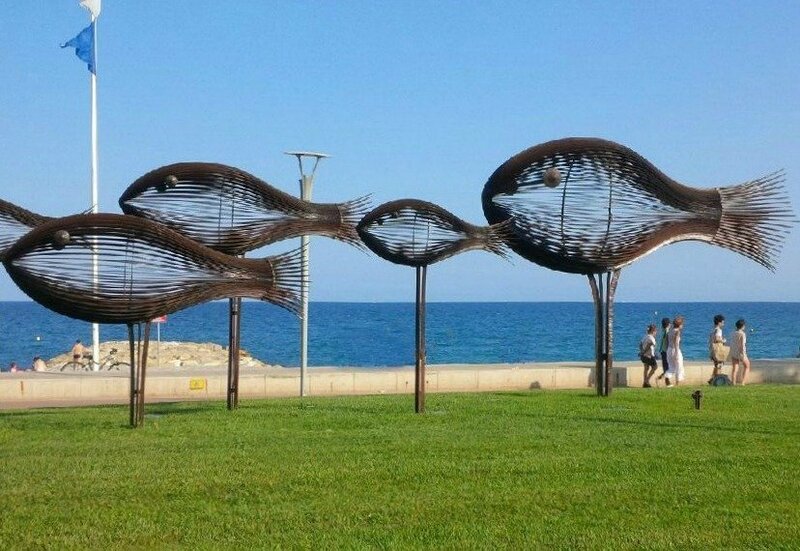 Shoal of Fish by Sylvain Subervie can be found on the seafront in Cagnes sur Mer, at the Eastern end of the Hippodrome. 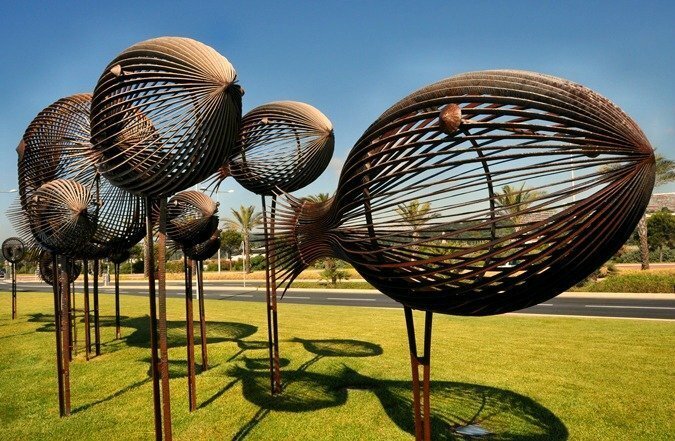 Made out of wrought iron, this sculpture consists of 12 fish of varying sizes from 2 to 4 metres. They play with the light and wind and better photographers than me have taken wonderful pictures of them, particularly at night. 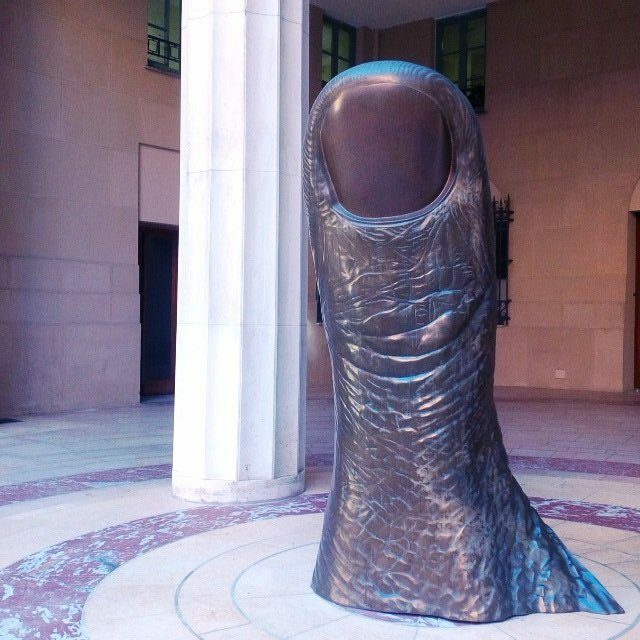 The Thumb by César, located in the entrance of the Hotel de Ville in Nice (city hall), is an actual imprint of the artist’s own thumb and is one of a series of several thumbs, located notably in Marseille and La Défense. This particular sculpture is the smallest at only 1.85 m high. The others range from 6-12 metres. César spent some time living in my town Roquefort les Pins and was also the creator of the bronze statues given to winners at the French equivalent of the Oscars, the “Césars”. I’ve always loved pictures and sculptures of hands and love the realistic detail in this thumb. Miles Davis by Niki de Saint Phalle standing outside the Negresco Hotel on the Promenade des Anglais in Nice. This larger than life statue of the famous trumpeter doesn’t bear much resemblance to the musician himself but it’s colourful and fun and evokes his spirit well. For more pieces by Niki de Saint Phalle, MAMAC (the Museum of Modern and Contemporary Art in Nice) has a sizeable collection of her art, including her take on the Loch Ness Monster a fountain made out of mirrors. While the items inside the museum can’t really be included in this list of public art (though the museum is free) the monster is located outside on the forecourt between it and the National Theatre, thus rendering it public, and includeable here. Also in this photo is Tribute to Alexander Calder, a wooden installation by Arne Quinze, which unfortunately, as I love it, is only temporary. There are plenty more wonderful works of art on the French Riviera, this may well be the beginning of a series. What do you think of my choices? Do you have any favourite sculptures or other forms of public art? Do tell! Ijust happened to spot a statue on aTV programe A Place in the Sun so I typed ‘Cloud-like statue on Cote d’Azure’ and found it!. I love Nomade. There is a beautiful sculpture os steel pieces by an English canal of the heads of two canal horses. Hi Pia, thanks for adding your suggestions. I love the Tête Carée but don’t know the Venet sculptures and haven’t been to Polygone yet. I look forward to checking out the art there. I like your Blogs a lot, thank you! Just a hint: The new Polygone Riviera Shopping mall has about 10 really great pieces of public art, free and outside. Also the library Tete Carrée by Sosno in Nice, and all the Venet sculptures in the city are well worthwhile. I agree Jan, and I’m toying with the idea of a series as there are plenty more pieces I’d like to highlight. 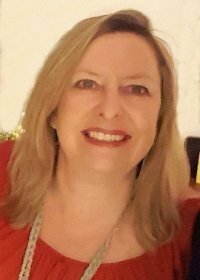 Hi Helen, how lovely to hear from you and thanks for subscribing. 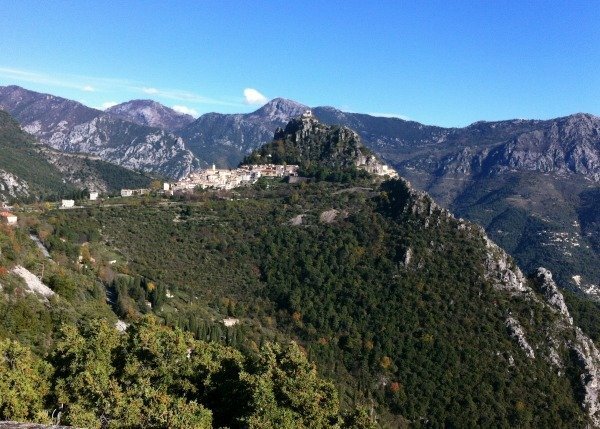 I hope next time you’re in the south of France you come and stay again, hopefully this blog will entice you back! Love to link up with you Corinne! Nice collection of public art. How realistic is that thumb! There is so much art around nowadays you could start a series. I LOVE Nomade and have a photo of myself standing inside it last time I was in Antibes a couple of years ago. 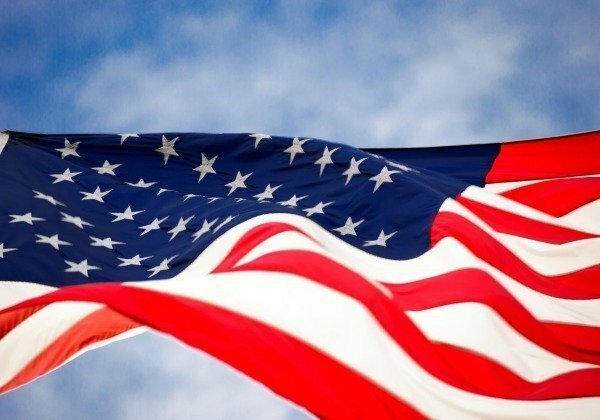 I have at last subscribed to your blog as a way of keeping contact with a part of the world we love. 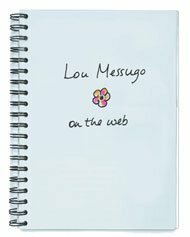 Hope to stay at Lou Messugo again. Difficult to choose a favorite. They are all great, but I do find the “Conversations in Nice” to be very intriguing. I think the sense is that it gives people pleasure, makes them reflect and encourages discussion. Public art will never please everyone but I think the world is a better place for installing things purely for aesthetics and not necessity. I’m glad you found the fish and conversations fascinating. Cynthia, Jaume Plensa has several works in the Meijer Gardens so I’m sure what you saw must have been by him. How lovely that he’s seen and appreciated all over the world. They’ve been there since 2008 Richard. Very interesting– I love public art… but I guess, who doesn’t? I have seem something almost identical to the first one you shared at the Meier Gardens in Grand Rapids, MI… I am positive it must be from the same artist! The riviera seems like a very suitable place for art like this. Are the fish new? 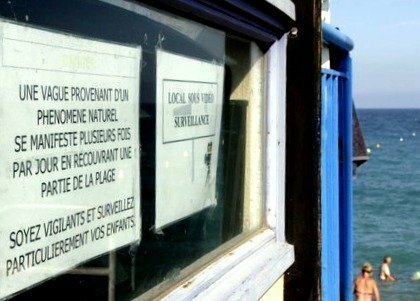 I don’t remember seeing them when I was last in C sur M. Anyway, I don’t think you need apologise for the quality of your photograph; it seems pretty good to me. Thanks Rosemary! I always appreciate your shares. I agree Camila, and we’re lucky around here that there’s so much. Thanks for your great photo Margo! I’m glad I showed you a new place to visit. Maybe you’ll get a better photo of the fish that I’ll want to use!! Hi Kriss, all of these are pretty recent, some as new as 2011. You should come back again and see the changes. 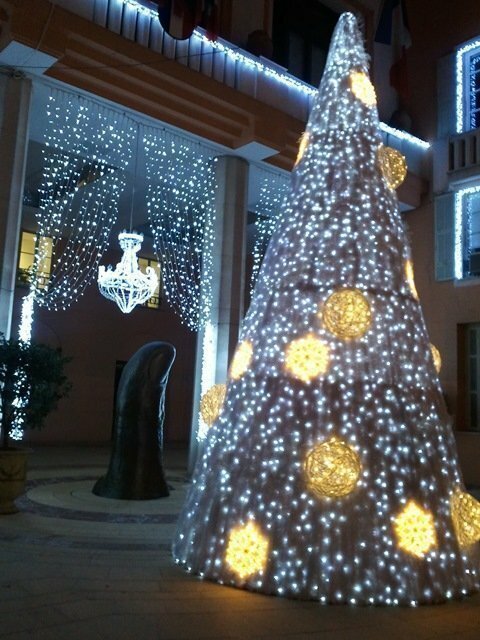 Nice in particular has been transformed in recent years, with a new park and plenty of new art. Very interesting post, Phoebe. I’m including it in today’s blogger round-up. This is such a lovely range of different art. I really love the Nomade and when I first glanced at the image I couldn’t see the letters; what a great idea! Love the Conversations a Nice especially. Your post has made me realise it’s been a while since I’ve visited this area as most of these are new to me.